Well, what an unexpected gem I found while out walking on Monday. 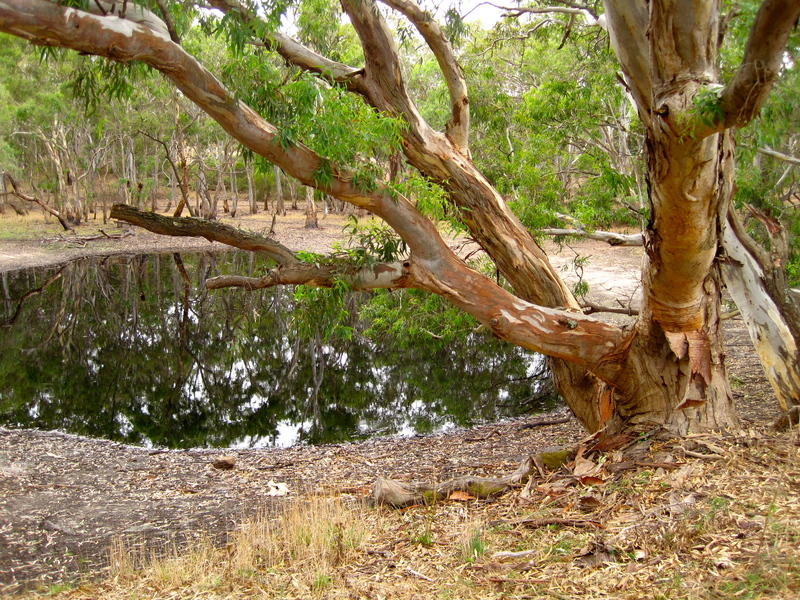 The Inverleigh Flora and Fauna Reserve is around 27km west of Geelong on the Geelong-Hamilton Road and just 2km NW of the pretty historic township of Inverleigh. I need to give directions, as it’s very hard to find information about this really worthwhile site, which is plonked in the middle of the largely treeless western volcanic plains farmlands. Cared for by a dedicated volunteer ‘Friends of’ group, this 1000+ hectare site represents remnant grassy woodlands, one of the most threatened eco-systems in Victoria, with only 1% of the original grassy woodlands of the state remaining. It really is worth spending a day there to explore, though there are no facilities and water, so you need to be self-sufficient. The reserve is known to have almost 50 species of native orchid: perfect for a spring wildflower walk. I also saw, among many other birds, hundreds of colourful eastern rosellas, as well as kangaroos, and even a sleepy koala up in the manna gums! The ancient dry river beds and flattened, worn sand dunes were shaped by volcanic activity some two million years ago. The walking is easy, but hot and exposed, so Black Gully Dam, about half way around the 9km circuit walk I did (which will be in the Best Walks of Geelong, Bellarine & Brisbane Ranges book), was perfect for a rest in the shade. Dogs are also allowed, though must be strictly kept on leashes and on the management tracks – and you’d definitely need to carry extra water for them, too. We undertook a circuit walk at the start of winter on a cool, calm day and it was perfect. The post above talks about being hard to find and then doesn’t elaborate on how to navigate so allow me to elaborate. Follow the Inverleigh-Teesdale Road through to the northern most part of the park and just as you are about to exit the wooded area there are two dirt tracks on either side of the bitumen road. The track on the western side (left when coming from Inverleigh) has an information sign which you can use to help navigate your way through the park reserve. There are a series of these dirt tracks which cris-cross their way through the reserve and are signposted somewhat (but not always) throughout. There is plenty of reception with Telstra so an aerial photo from Google Maps could help guide you through or take a map and compass. It is well worth a visit to see how much of Geelong region would have looked many moons ago. Thanks for that Mark – I am glad you enjoyed it as much as I did – there is a full write up of the walk, with directions etc, and maps in myBest Walks of Geelong, Bellarine and the Brisbane Ranges book, but the photo of a google map image is also a great idea!